The ability to accept credit cards at your business or on your website is incredibly important to having a successful business. For many businesses, accepting credit cards is the difference between the business succeeding or failing. However, for anyone who has tried to choose a merchant account provider in the past, you know this can be a tricky process. We don’t think it needs to be. Merchant accounts, sometimes called virtual merchant accounts, are dedicated accounts that help a business to take and process payments using credit cards, debit cards, and other similar forms of payment. The merchant account is actually a relationship with a payment processing company, like us, that goes through a series of virtually instant checks, when you swipe, enter, or gather the credit card information. The payment information is verified to make sure the cardholder can make the payment, and then processed. From there, the payment processing company finishes processing the payment and then deposits the money into your bank account. The verification of the payment happens within seconds and the funds are usually placed in your bank account within 2 days. For this service, a small fee is charged on transactions. There are many different types of credit card processing solutions and it is important to choose the right solution for you and your business. 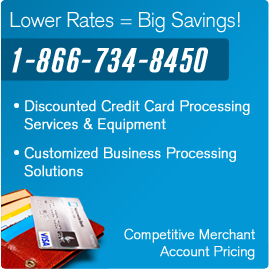 Learn more about different credit card processing and merchant account solutions or just call us at 1-866-734-8450 to talk to a customer service representative about possible solutions. Retail Swipe Terminal: This credit card processing solution is best for retail and store front merchants, like restaurants and hotels, who interact with their customers face to face. Normally with a retail swipe terminal, customers or retailers swipe their card though a terminal. This type of processing is usually the cheapest type of virtual merchant account because the chance of fraud is the lowest. Real-Time Processing: Real time processing usually is the best solution for business online who need an internet merchant account. With a virtual merchant who has real time processing, everything is completely automated and the merchant (you) doesn’t have to do anything. Real time processing and virtual merchant accounts with us are 100% secure and safe. Virtual Terminal: For internet or in person businesses who also want to take orders by mail, fax, or phone, a virtual terminal for credit card processing is usually the best solution. With this type of virtual merchant account, the merchant logs into a secure site to manually enter the payment information and process the account. Wireless Merchant Solutions: For merchant accounts where credit cards and payments can be processed using a mobile phone, there are two main types of solutions. First, using a wireless swipe terminal, the credit card can be swiped through a small device attached to the phone. These are becoming increasingly popular at trade shows, markets, and any traveling business. Secondly, some wireless merchant accounts allow you to enter credit card and payment information manually into the phone. Ready to learn more about accepting credit cards on your website or at your business. Call us at 1-866-734-8450 to learn more or get a quote.